Fly back to 1957 when Jason Roberts was beginning his career as a young San Francisco lawyer. This fast paced story explores the destruction of myths and collision with reality that are the central focus of this novel, a polyglot of actual events molded into the fantasy of the writer's imagination. The elegant restaurants of the day, the beatnik clubs on upper Grant, the lives of the people of the city come alive as the plot unfolds. Lorraine MacPherson, illegally in the United States from Canada is facing imminent arrest by the immigration service. Wendy, the wife of Lorraine’s boss, suggests she marry to avoid deportation. Lorraine and Jason meet the fellow Wendy has chosen to marry her in a second story gay bar discretely hidden from public view. Jason is overwhelmed by the encounter and eventually understands that he has fallen in love with Lorraine himself and they marry. They rent a quietly classic apartment on Nob Hill, its windows overlooking a Regency mansion next door, the only one left in the area privately owned and still occupied by one family. Lorraine becomes obsessed with the neighbours, secretly monitoring their movements, wanting to meet them but lacking either opportunity or social connections to achieve it. Two men live there and one woman other than the servants. The development of the relationship between Jason, Lorraine and the next door neighbors, Jackson, his brother, Jeremy Stoddard and Jackson's wife Viola form the essence of this novel. Strolling through the pages we meet a coterie of unique characters, Susan St. John, her name pronounced CINJUN a prominent socialite, believed to have bedded even presidents. There is Whitney Hill, the fey yet charmingly elegant, wealthy gentlemen considered an essential guest at any party regardless of his affected manner of speech. Jason becomes more focused after marrying Lorraine. His professional success is propelled forward when the Stoddards suggest he help them in the take over a new bank being formed by Nate Silverstein. Nate is crass and overbearing, yet highly successful in the banking business. The developments of the bank, the inter-relationships between the various personalities, the intrigue, struggles for control and approach to business are treated in depth leading to a surprising and unexpected twist as the story concludes. It's true what they say. Don't judge a book by its cover but at the same time it doesn't do any harm to have a cover that stands out and this one is a bit uninspiring. The blurb is also too long and if I could, I would delete some of it e.g. the first paragraph and rephrase much of the rest. Once you start the story though, you'll be glad you did. The tale centres around an ambitious young couple who have moved into an affluent area. 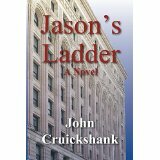 Jason is starting out as a lawyer and through good luck and knowing the right people he is asked to help take over a new bank and be involved in its day to day operations. Jason is married to Lorriane. I didn't really warm to her as a character as she is spoilt, shallow and overly concerned with prestige and money. However, it came across that she genuinely loved Jason and the pair worked well as a couple. I liked how Jason held his ground and didn't allow Lorraine to dictate to him. The story is very focused on the characters and their relationships to each other. I liked the Stoddards and I wanted their venture to succeed. I also enjoyed seeing the dodgy characters get their comeuppance as their irregular banking practices were uncovered towards the end of the novel. I also got a good sense of the time period in which the story is taking place. The characters' actions and prejudices reflect the era very well. For the time period, Jason and Lorraine appear to be very open minded and accepting. As the blurb states, there is a little twist at the end but it isn't entirely unexpected. I liked how that revelation was left until the very end and it ended the story on a nice note. It is also free with a Kindle Unlimited subscription. Thanks for a great review. Hope others see it and will be encouraged to read my new book. Those who do, I know they will enjoy the people and places of the time.